I don't stage houses often (like Linda does), but occasionally a client will ask me to help them with a home they are selling and I will do what I can. Staging a home to sell is not all that different then how I approach decorating a home except that it usually requires a lot of editing (removing, de-cluttering, and re-arranging) and instead of appealing to the client's taste, I try to anticipate what the average buyer will be attracted to. The goal is to help a prospective buyer see the house at its best and also help them see themselves living there. Last week I started the first phase of a small home that is going to be put on the market soon. 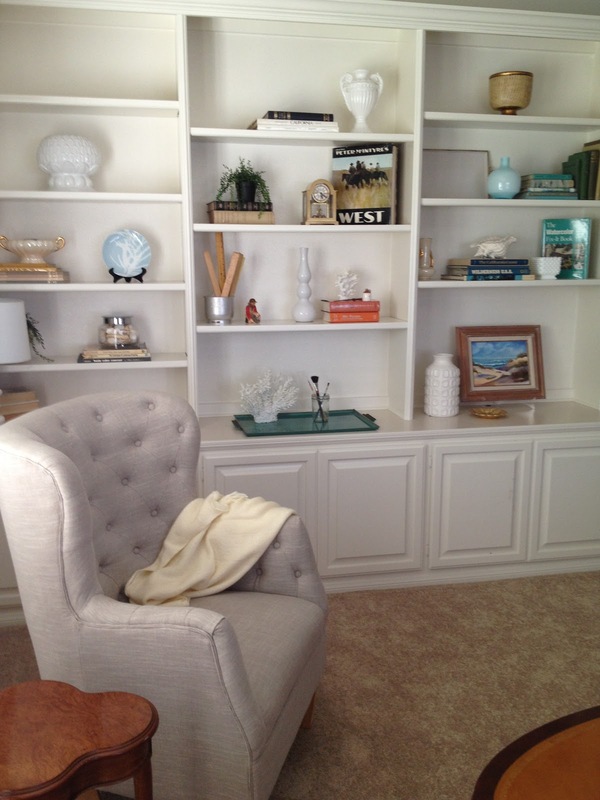 On our first visit we talked about the client's (and my) vision; a calm, uncluttered space with a coastal feel. We discussed what needed to be removed or replaced, and I spent a little time moving a few pieces around, measuring and taking a mental inventory of what we needed to add. Because the bookshelves were such a huge focal point in the living room, and also the most daunting task, I tackled it first. I started by removing what I knew we didn't need (about 80% of the books and 50% of the accessories so they could be packed up or donated) and did a little pre-arranging to help me assess what we would need to add. Then my client and I went shopping. We went to Ikea, HomeGoods, Target and a few consignment shops nearby. We brought home a truck load (literally) of small furniture, artwork, mirrors, bedding and small accessories. The client had brought some items from her own home (this is her mother's house she is selling) and had it all put in a storage closet for me to pull from as needed. 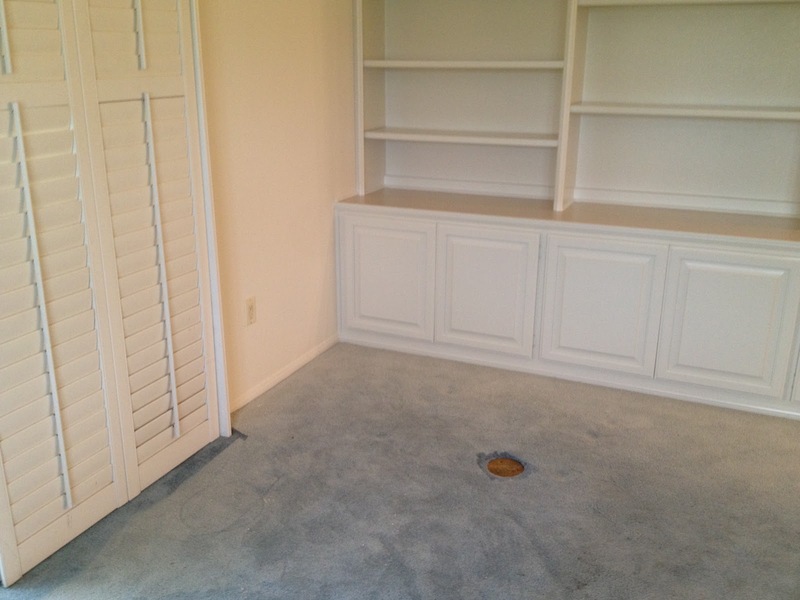 We also selected new carpet and had a painter come and put a fresh coat of white paint on everything. After the carpet was installed, I went over and began the first phase of the staging / styling. 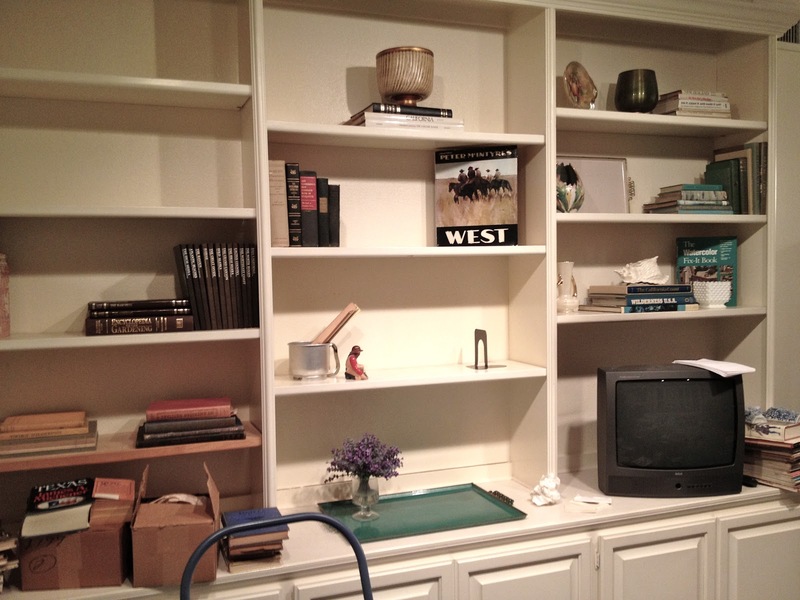 I started with the bookshelves. Previously it was crammed filled with a lot of books, a small TV and a lot of other objects. It needed to be pared down and lightened up. 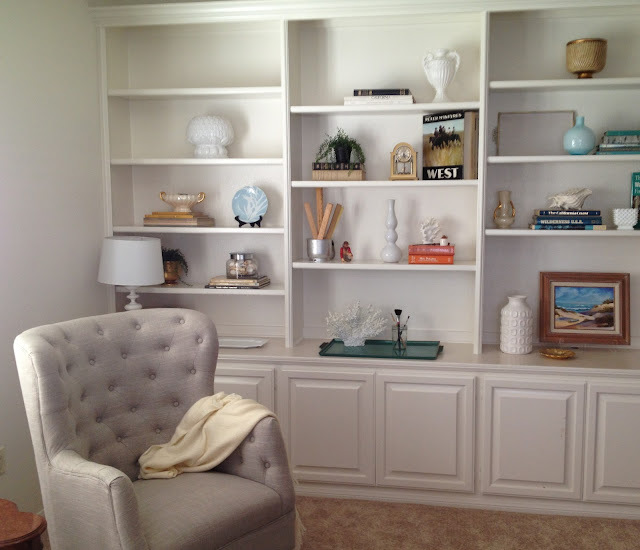 I used a combination of things that were on the shelves already and added a few new items from the client's home. This home is in a retirement community so we wanted to have the home not only look pleasing to the prospective buyer but help them envision themselves living in the home. Our choices were made accordingly, from the carpet selection to the accessories we used to style the home. For example, even though the kitchen is small my client explained that the buyer will most likely want to have an eating area in the kitchen. We replaced a larger kitchen table for one that would seat a party of two without making the space too crowded. The white table from Ikea and the open weave chairs help the area feel visually clean and less cramped then it was before. This was a quick start and I will need to spend another day finishing the bedrooms, styling the bathrooms and hanging artwork. And then it will go on the market and hopefully our hard work will pay off and the house will sell quickly and for a good price. Sounds like my past few days Sherri - we're in the process of getting our home ready to sell and we've been doing lots of decluttering, organizing, etc. My goal is to work with what we have as much as I can. I did pick up a new rug at Target yesterday for next to our bed, which I will use again in our next home b/c I love it. And I also got a new coverlet for the guest room, which I would also use again. I think I may need to pick up a plant for one bare corner but we're in good shape. This looks great. The styling of the shelves is organized and colorful, and I've always loved those open weave chairs from Ikea too. Nice job. You are so right Sherri...it's all about creating the image of a certain lifestyle that the buyers will visualize themselves having if they live there. I did this with my two previous homes that I sold in a few days for full price. It really works! When I did a post about staging my home on my blog I received some really good advice from Annie of Most Lovely Things blog...she said she puts out a tray of homemade treats and bottles of water and juice when perspective buyers are coming. I did this and the very first buyer that came through bought my house for full price! Nice post Sherri, the changes you made make a world of difference and I really like those cute Ikea table and chairs. I'm sure this house will sell quickly. Sherri the house looks great. The built-ins and new chair look like they were born to go together. 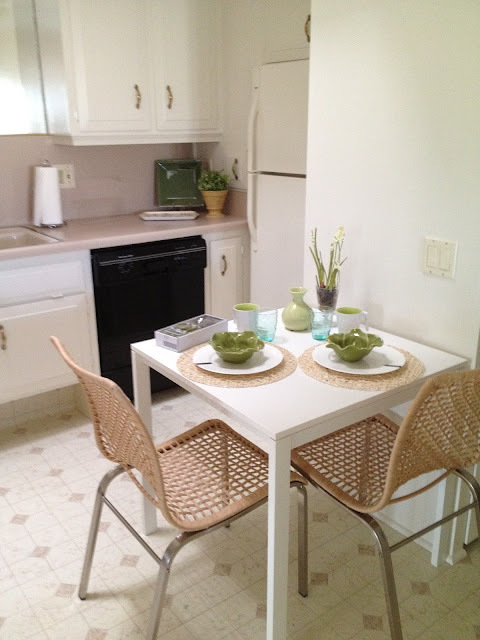 The Ikea table and 2 chairs in the kitchen are PERFECTION! You managed to provide an eating area without taking up much space. BRAVO!!! so right, staging makes all the difference! You did a fantastic job on the shelves, and the chair looks like it's always been there. Great job, it all looks lovely!